As immigration activists gathered in Lower Manhattan on Friday afternoon, chanting in Spanish to denounce the Supreme Courtdeadlock that effectively shut down President Obama’s program of deportation relief, a group of eight advocates stood quietly in the back. They held hand-painted signs of protest. “We’re all immigrants,” one sign said in Chinese. “We want to see comprehensive immigration reform,” another said in Korean. Not so pithy, but present. Asian immigrants and their advocates say they are used to being a minority within a minority at rallies such as these, and Friday’s gathering, organized by the immigration rights group Make the Road New York was no different. The small band from the MinKwon Center for Community Action, a predominately Korean advocacy group that also serves the Chinese community in Flushing, Queens, was but a fraction of the 100 protesters. 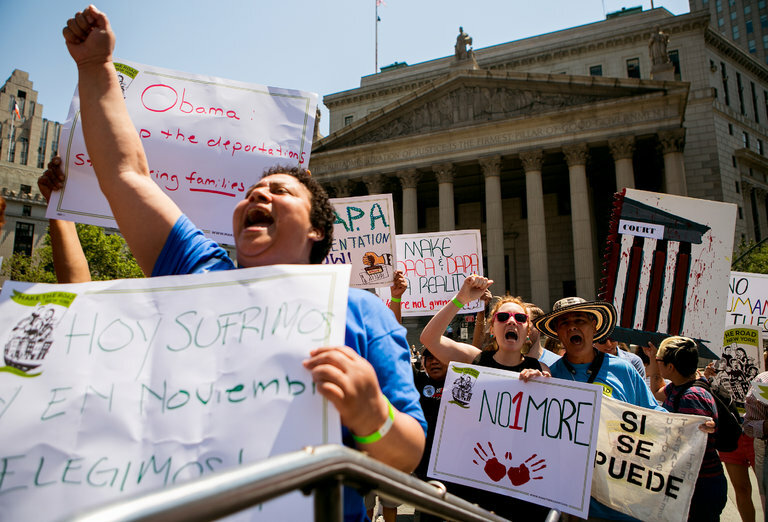 Under the glaring noon sun in Foley Square on Friday, undocumented Hispanic families with small children in baby carriages joined union members with megaphones and longtime leaders from advocacy groups; many came in defiance of their lack of legal status. In New York City, more than 220,000 immigrants would have been eligible for temporary protection from deportation under the president’s executive actions, which included a protection for parents with children who are American citizens or permanent residents. According to the Mayor’s Office of Immigrant Affairs, about 11 percent of those eligible were born in Korea or China. “That brings up the question, why aren’t they all here?” Mr. Jeong said. For Korean parents, being undocumented was a mark of shame, Mr. Jeong and the fellow MinKwon members explained. “I grew up in that environment where you don’t tell other people your status, or something bad will happen to you,” Sangmin Na, 26, said. Mr. Na, a graduate of Hunter College, was a beneficiary of the 2012 program Deferred Action for Childhood Arrivals, which protected certain undocumented children who were brought to the United States by their parents; it remained unaffected by the Supreme Court’s decision this week. Mr. Jeong was also covered by the deferred action program, enabling him to graduate from City College of New York and land an engineering job that starts next week. They came to the rally to show solidarity. “It’s not just Latino struggles, it’s everybody’s struggles,” said Jung Rae Jang, 26, a community organizing fellow at MinKwon who came from South Korea at 15. One of the designated speakers at the rally, he urged his fellow immigrants to keep fighting for reform and to encourage others to vote. Mr. Jang said that he would like to organize more events in collaboration with the Hispanic community, but “language barriers are a problem,” he said. Ester Rim, an intern at MinKwon, could, however, relate to the disappointment in the Supreme Court. Born in Brazil to Korean parents, she moved with her family to Queens when she was 4. Her parents, she said, would have been eligible to apply for administrative relief because her sister had become a permanent resident. Ms. Rim, attending Macaulay Honors College at the City University of New York on a scholarship, did not even tell her parents about the possibility that they could have qualified. “I can’t even imagine how much heartbreak they would’ve gone through,” she said. On Friday, the activists who came to the rally proclaimed that they would continue to work for immigration reform. “A people united will never be defeated,” they shouted in Spanish, followed by the chant “Sí se puede” — Yes we can. “I couldn’t really say it,” Mr. Na said of the Korean words.